BRAID Preview: Thriller Described as "Punk Alice in Wonderland"
There's this stylish film called Braid that's making the festival rounds that looks too wild to miss. 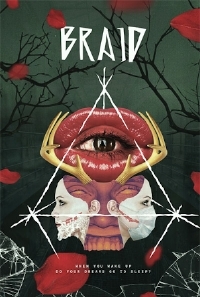 It's called Braid and it's about two wanted women who decide to rob their wealthy psychotic friend who lives in the fantasy world they created as children and to take the money they have to take part in a deadly perverse game of make believe. The film is directed by and written by Mitzi Peirone and stars Imogen Waterhouse Sarah Hay and Madeline Brewer. One reviewer out of Tribeca recently reported that, "It’s difficult to define a film like Braid. Punk Alice In Wonderland exploitation? A Lynchian headtrip dashed with Ana Lily Amirpour’s sense of sensationalism? Pastel-blasted mind imprisonment thrills paced by Mozart remixes and experimental unrest?" Here are the first stills from the film. We'll be keeping our eyes out for a trailer.